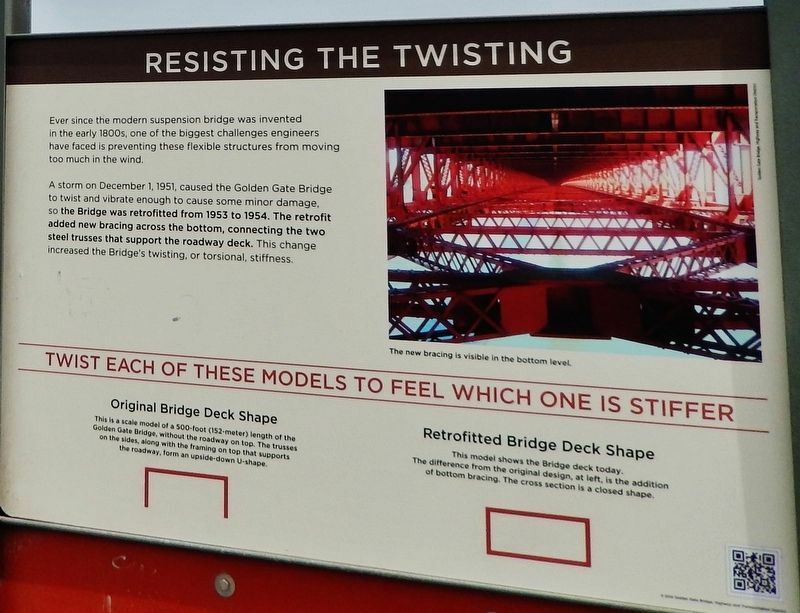 Ever since the modern suspension bridge was invented in the early 1800s, one of the biggest challenges engineers have faced is preventing these flexible structures from moving too much in the wind. 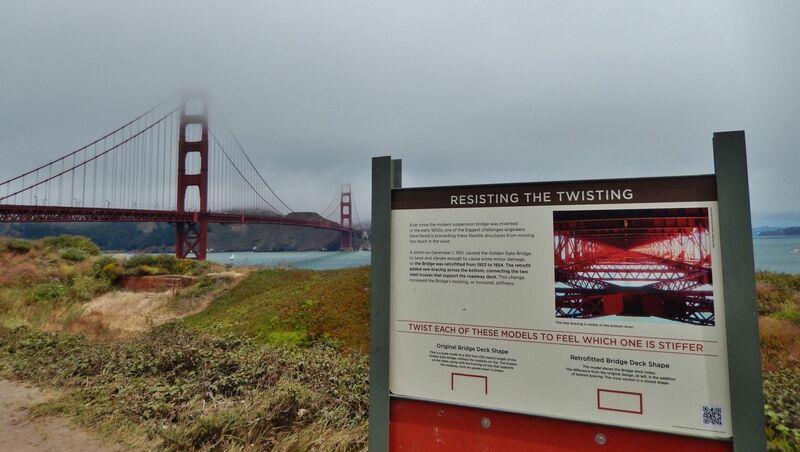 A storm on December 1, 1951, caused the Golden Gate Bridge to twist and vibrate enough to cause some minor damage, so the Bridge was retrofitted from 1953 to 1954. The retrofit added new bracing across the bottom, connecting the two steel trusses that support the roadway deck. This change increased the Bridge's twisting, or torsional, stiffness. 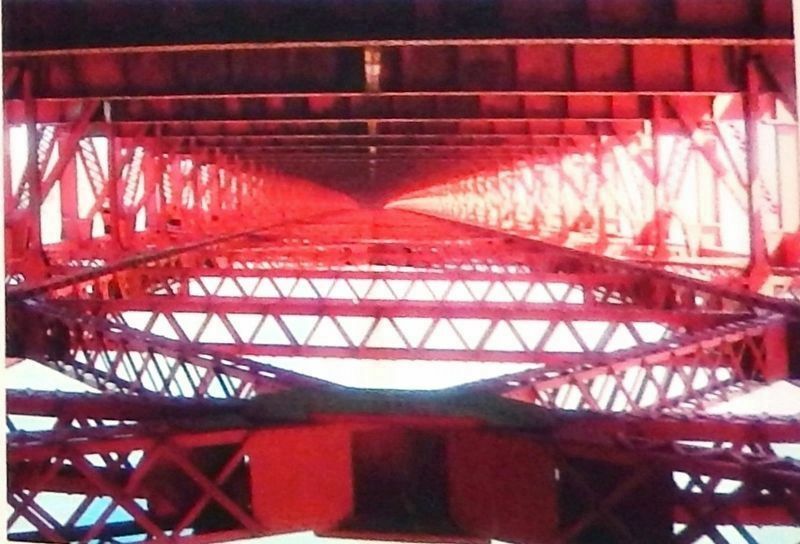 This is a scale model of a 500-foot (152-meter) length of the Golden Gate Bridge, without the roadway on top. The trusses on the sides, along with the framing on top that supports the roadway, form an upside-down U-shape. This model shows the Bridge deck today. The difference from the original design, at left, is the addition of bottom bracing. The cross section is a closed shape. 48.488′ N, 122° 28.441′ W. Marker is in San Francisco, California, in San Francisco City and County. Marker can be reached from the intersection of U.S. 101 and Lincoln Boulevard. Touch for map. Marker is located along the Battery East trail, about 1/10 mile west of the Battery East parking lot. Marker is in this post office area: San Francisco CA 94129, United States of America. Touch for directions. Other nearby markers. At least 8 other markers are within walking distance of this marker. The Era of Earthworks Batteries (a few steps from this marker); Fort Point National Historic Site (about 700 feet away, measured in a direct line); The Golden Gate Bridge: Vision, Genius and Expert Care (about 700 feet away); Fort Point (approx. 0.2 miles away); Crissy Field (approx. 0.2 miles away); Setting A Deadly Obstacle Course (approx. 0.2 miles away); Men of Vision (approx. 0.2 miles away); Castillo de San Joaquin (approx. 0.2 miles away). Touch for a list and map of all markers in San Francisco. More. Search the internet for Resisting the Twisting. Credits. This page was last revised on March 18, 2019. This page originally submitted on March 17, 2019, by Cosmos Mariner of Cape Canaveral, Florida. This page has been viewed 41 times since then. Photos: 1, 2, 3. submitted on March 18, 2019, by Cosmos Mariner of Cape Canaveral, Florida.